Sentry, Spider-Man, Ares, Dokken Daken and now Iron Patriot. As soon as somebody comes up with a Moonstone and evil Hawkeye, the Dark Avengers will be complete! His Iron Patriot armor blazes red, white, and blue, but what care the true colors of Norman Osborne? Engineered by Norman Osborne from stolen Stark technology, the Iron Patriot armor was painted with the colors of Captain America, creating a false icon to rally the people behind Osborne's sinister team of Dark Avengers. Nope, no better. More useful information than is found on the back of the packaging, but it still doesn't get the guy's name right. Here, look, it's easy: "Normane Osbron." Wait, crap! This is harder than it looks. Marvel Legends Iron Patriot makes the same mistake that Marvel Universe Iron Patriot made: he's just a repaint of the Extremis armor, when that's not what the Iron Patriot suit was in the comics. Norman's smart enough to build a Goblin Glider, but that doesn't make him smart enough to copy Tony Stark's cutting-edge technology; it just makes him smart enough to jury-rig an older armor. Key word being "older" - it really should have been the "Advanced Armor" mold, though this one was probably cheaper for them. Who knows if those 8-year-old steel tools even still exist? 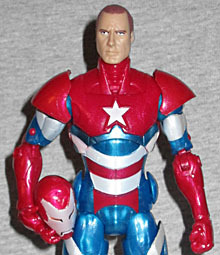 Iron Patriot isn't an exact copy of the ML1 Extremis figure - for one thing, the star beam on his chest is a molded part of the figure, rather than being glued on like it was for the MU figure. Proving that Norman wasn't as good as Tony when it came to engineering, his chest-beam was never as powerful as the ones in the actual Iron Man suit. Just throwing that out there. Interestingly, this figure gets different hands than the ML1 version did: his right hand is open and his left is a fist, rather than the other way around; was this mold (like this mold) originally meant to have interchangeable hands? The colors on this figure is truer to the comics than the 4" figure was - he gets a lot of the semi-translucent plastic that all three Iron Man legends released so far have used, but the layout is what you saw on the printed page. His eyes are painted orange and outlined in black, so you'll want to make sure those are straight before you buy. Also check the stripes on his abdomen, and the fullness of the star on his chest. 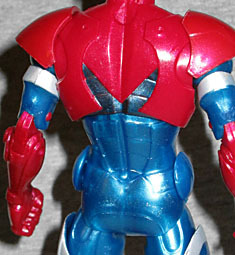 Iron Patriot comes with the most exciting Build-A-Figure piece in the first wave of this series: Iron Monger's torso! It's got an octagonal collar around the neck, a squarish chest beam and lots of overlapping plate armor. I can't wait for the remaining three figures to be released, so I can finally assemble this big guy! 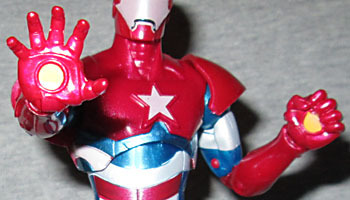 Like we said before, the first half of this "Iron Man Legends" series comprises a repaint, a re-release, and one new figure - Iron Patriot, obviously, is the repaint. But he's a good repaint, though; he matches the comic, and he uses a mold we haven't already seen two dozen times before. No more using the Captain America armor as a poor stand-in! Plus, since the head is on a balljoint and pops off easily, you can use the head from Hasbro's two-pack SHIELD agents to create a quick and dirty unmasked custom. Sure, the head's a little loose, but it does a decent job of standing in for Norman Osborn. Oh hey, look at that! I spelled his name right. How about that!